Shrikant and I came into contact through our respective organisations, and explored ways in which I could work with the TICO group. I have a personal interest in BN as a ‘storytelling vocabulary’; its hand, eye and body gestures are capable of retelling entire epics. 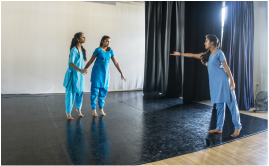 Shrikant was keen to diversify the girls’ dance training beyond the stringent requirements of the BN exams, and to help them reclaim the form for their own self-expression, as young adults of Indian heritage living in the UK. 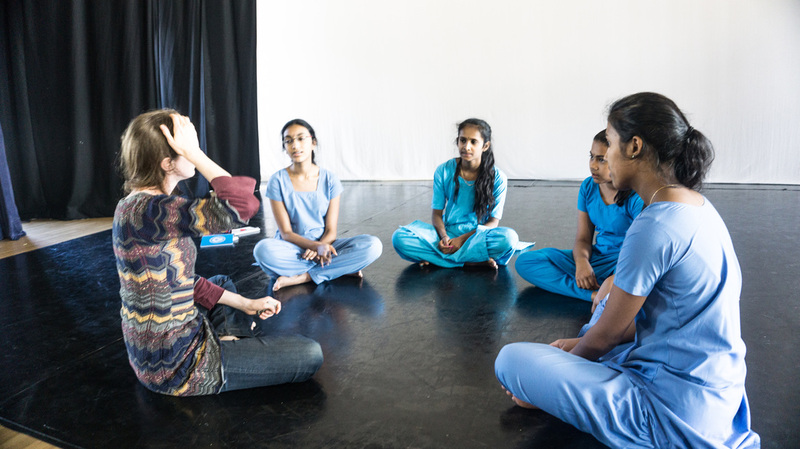 I suggested a syncretic approach in which I might bring stories from other cultures than the Indian, and invite the girls to use their dance vocabulary to choreograph retellings of, or responses to them. In summer 2015, I met for the first time with the group to discuss their ideas around storytelling and BN, and brought them the Irish (or Scottish) legend of ‘The Seal Wife’, a selkie woman divided from her human children. I chose this story for its possible resonances with the experience of being ‘between cultures’, which Shrikant had identified as affecting all the girls. ​I sensed a disparity between their uncertainty in conversation about BN as a storytelling form - they were unfamiliar with the stories they danced, except as memory aides to remember difficult sequences of moves - and their remarkable ability to express the core emotional trajectory of the selkie story symbolically through dance. Their performance conveyed, too, an empathic understanding of the difficult choices faced by the Seal Wife, though the resonances which struck the girls were primarily around divorced families rather than cultural divides. Shrikant felt that, as well a greater sense of freedom and possibility regarding their dance form, the girls would benefit from having ‘a storyteller as friend’, a role he felt he could not fully embody himself because, in his words: ‘In the traditional pedagogy of Bharatanatyam the teacher is seen as a guru, the revered master, and he keeps a distance from the students.’ We therefore sought further opportunities for me to work with the group and help develop their nascent choreographic and storytelling skills. The ‘Storyknowing’ symposium offered such an opportunity. This time I brought the Rwandan coming-of-age myth ‘Miseke’, whose combination of rich cultural detail and archetypal themes (a young girl must escape her parents’ restrictions, overcome supernatural threats, and attain adult status) made it ripe material for translation into BN. The girls relished finding cultural equivalences and gestures to express the conditions of Miseke’s life and the choices she had to make. They felt no need to ‘modernise’ the story; they rather gravitated towards distilling it down to its essence. As some of them were unable to attend the symposium, Shrikant and I had to take some of their roles in the resulting performance; despite my inferior movement skills, my physical participation gave me the full impact of the emotional punch of the arc they had put on the story. This is one of several cases where I have worked with young people who possess a skill that immediately puts us in a complementary and equal relationship as collaborators, learning from each other’s artforms. In both short projects I felt that the TICO girls’ dance knowledge brought them an understanding of the different possible logics of narrative far in excess of most young people’s (or indeed, most adults’), and that this was a tremendous asset to them in expressing their identity or indeed whatever they wished. The main significance of my contribution was simply to point out the value of this; the stories I brought were needed only as test cases. If circumstances permit us to continue our ‘friendship’, it will be one of mutual benefit.